Cardinals baseball head coach Dan McDonnell was inducted this month to The Citadel Athletic Hall of Fame for his days as an all-conference second baseman for the Bulldogs. “You get inducted into the school’s athletic hall of fame and it’s a great honor. I love the university, I loved my time there, and it just motivates me more as a coach to help them get the most out of their experience,” McDonnell said. But baseball wasn’t always the first choice for the 23-year veteran of collegiate athletics. Those words alone are proof that McDonnell truly did find his passion for baseball in college. He walked away from his college career with school records in stolen bases and walks, as well as contributions to two Southern Conference regular season titles, the 1990 league tournament crown, and the 1990 Atlantic Regional. In addition, he was a member of the Bulldog’s 1990 trip to Omaha for the College World Series. “I was blessed to play with a really great group of players,” McDonnell said. “We accomplished a lot as a team. We played in the College World Series, which was an amazing experience. I’m a product of my society. I played with great players, and then I got right into coaching there and I got to coach great players and really enjoyed coaching in a way even more so than playing because I was helping others.” Immediately after graduating from The Citadel, McDonnell began working as an assistant coach to Bulldogs baseball. He was there for eight seasons before a six-season assistant coaching stint with Ole Miss. If watching his players succeed is what Coach McDonnell is aiming for, then no one can say he isn’t doing his job. The Cardinals lost seven players from last year’s squad to the MLB draft, which in baseball is the ultimate success out of college. He doesn’t take all the credit for recruiting the pro-worthy players, though, mentioning assistant coaches Roger Williams and Chris Lemonis, Co-recipients of Baseball America’s Assistant Coach of the Year award. “We’ve been here seven plus years together and we obviously work very well together. I’m extremely proud of their accomplishments,” Coach says. “They work extremely hard, they’re very competitive, they’re very loyal and they’re great people.They recruit with the understanding that we’re going to help get them ready for pro ball,” McDonnel said. 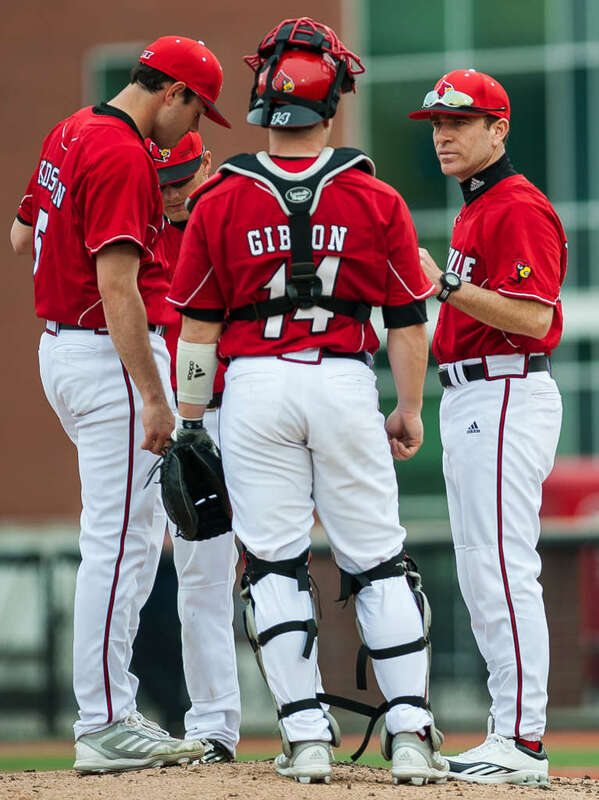 With a professional mentality and strong background, it’s no wonder Coach McDonnell led the Cardinals to their first World Series appearance since 2007 last season, but he knows with the standards of U of L athletics the work is never done. “Time will tell if we’re successful immediately. We’re hardheaded and we’re stubborn. We don’t want to take a step back,” McDonnel said. After the 2007 and also successful 2010 season, the successive 2008 and 2011 teams seemed to have a lull where younger players were making up for the lost older players while still training. Coach is determined to see a different outcome in 2014 after a successful 2013 season.